Service to nation is never free. For seven years, I was the spouse of a soldier. My ex-husband and I moved four times during those seven years. I gave birth to one baby on the west coast and another on the east coast, gaining my California Beach boy (almost exactly 13 years ago) and my Sweet Georgia Peach not quite two years later. Additionally, we spent time calling Virginia and Texas home. I’m grateful for all that those seven years of service gave me and taught me. From sea to shining sea, I got to spend time exploring our beautiful nation. Living in military housing afforded me the opportunity to meet a wide-variety of people from all walks of life. Their stories have stuck with me. Their friendships have blessed me. Today, as I scroll through my Facebook newsfeed, I am amazed at how many of my 700+ friends came from those seven years of military life. I wouldn’t trade that time and those experiences for the world! And yet, there was a price to pay. While I’d never blame military service completely on the failure of my first marriage, I do believe that frequent deployments and the stress of separation played a major part in the death of that relationship. Currently, their dad is temporarily deployed to Liberia in response to the Ebola epidemic. My kids worry about their dad, fearful of what might happen if he gets sick while trying to help out another nation. Protecting their hearts gets harder and harder as they grow older. Service to nation is not free. It’s always been an honor to say that my dad was a veteran. My dad joined the army shortly after he and my mother were married. I recall him telling me that he knew he would soon be drafted, so rather than wait for the letter to arrive in the mail, he went to the recruiters himself. By doing so, my dad was able to finish college before leaving for basic training. I used to love to listen to my dad’s tales about the Army. One of my favorites was how he used too tell about how once he was put in charge of an entire barracks of soldiers. He was responsible for the condition of the barracks (neatness and cleanliness) as well as knowing the whereabouts of all the soldiers assigned to that barracks. He had to report any that were not in by curfew and each morning at formation account for everyone. Dad would always elaborate on how the other barracks were in such a disarray, with soldiers always out past curfew or not up in time to stand in formation. He would go into great detail about how the other barracks were full of fighting, drunken soldiers. But not his barracks. Dad would proudly say that his group of soldiers were always on time. Their beds were made properly, uniforms sharply pressed, the floors were mopped and the bathrooms kept sparkling clean. He said not one soldier ever missed a curfew and each morning they were all standing outside, perfectly in formation with their boots shining in the morning sun. In fact, for three or four months in a row, my dad received the award for the best barracks, earning the right to eat a private lunch with the Lt. Col., and honor that still thrilled my dad years later. My dad was so proud of his military service. A couple of Christmases ago, my siblings and I gathered all my dad’s military patches and medals, and put them into a special display case. I wish I could say it was my idea. It wasn’t. It is my brother who deserves the credit. I’m just grateful he included my sister and I, allowing us to share a part in giving the gift to my dad. I don’t know that I’ve ever had more pleasure in watching someone open a gift than I had that Christmas when my dad opened up the display case with all of his military regalia. I thought my dad’s smile was going to burst the seams on his face! For as long as I live, I will never forget that moment. Service to nation isn’t free. My dad was once a soldier who served his nation during a time of conflict and war. Though he returned home, my father long remembered the names of those he knew who gave their lives in protection of our nation’s freedoms. When I was in high school, a touring replica of the Vietnam Wall memorial came to our area. My dad insisted we go view it. I could tell it was a solemn event for him, far more than a simple wall or just a group of names. He knew each one represented a real man who never came home. He understood the price these soldiers had paid. My father didn’t die in Vietnam. Rather the war took nearly 45 years to kill him. You see, during his one year in Vietnam, my dad was exposed to Agent Orange. If you look up the effects of Agent Orange exposition, the list is long. Everything from cancer and other debilitating diseases like Parkinson’s to high blood pressure, diabetes and heart disease. My dad experienced the last three, his first heart attack occurring in his mid-40’s. I think he had 3 more over the next 20 years. In the last year or two of his life, my dad’s heart functioned at just barely over 20% of full pumping capacity, yet he continued to wake up each day and live a full life. 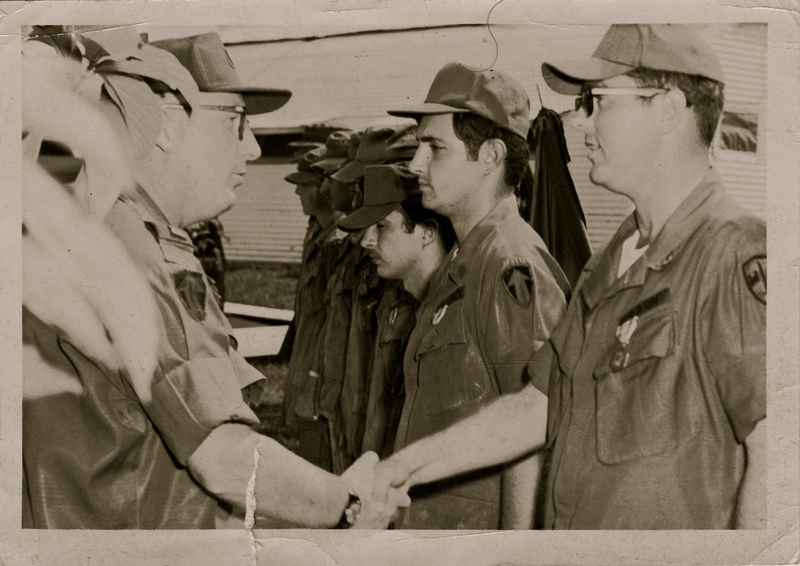 Several years ago, my father began to receive a full veteran’s disability from the U. S. government as a result of his exposure to Agent Orange. While he was open and honest about the fact that he had suffered from effects of the exposure and was receiving compensation, my dad never once complained to me (or to anyone else that I am aware of) about those resulting consequences. I’m thinking of all the veteran’s I’ve known and loved. My two grandfathers who both served the nation during WWII, my husband’s father and brother, a couple of cousins, the myriad of friends I’ve made during my years wandering the nation’s military bases as the wife of a soldier. So many people have given their time, and some their very lives, to protect our freedoms and rights as Americans. I think it is important to remember that service to nation is never free. The cost is there and paid by each one … and I’m so grateful. 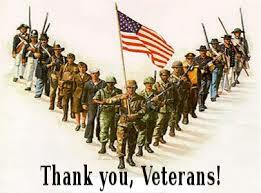 May God bless our veteran’s … each one who serves or continues to serve! And may we never forget to count the cost because their service to nation is never free. I never realized it myself until I spent seven years as a military spouse, Diane. It was an eye-opening experience. Now I still feel as if I experience some of it first hand as I raise my three military children … helping them cope with their father who is often unavailable and working in dangerous locations. It’s not easy to be in the military, but I must say that most of the folks I met felt it was a privilege to serve our nation. That makes it even more amazing when you think about it!